Are you a real estate investor still trying to figure out the complex process of creating a renovation plan and estimating rehab costs for your projects? The Book on Estimating Rehab Costs is written by active real estate fix-and-flipper J Scott, author of the popular real estate website 123Flip.com, and is published by BiggerPockets Publishing, the publishing arm of the premier real estate investing website BiggerPockets.com. This 200+ page book provides a step-by-step methodology for learning how to create a Scope of Work (SOW) and how to estimate rehab costs on your renovation projects. 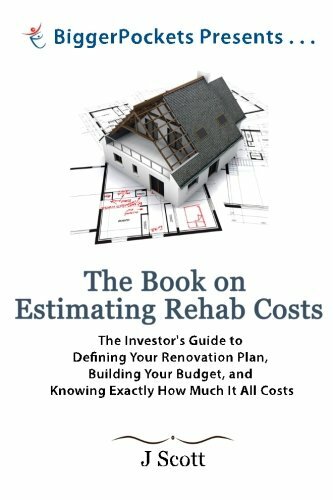 Whether you’re a rehabber, a wholesaler or a landlord, this book will teach you the process of evaluating the scope of a rehab project and estimating the cost of completing that renovation. This is the methodology that the author has used to over the years to complete hundreds of rehabs, both for himself and for other investors. From cosmetic renovations to mechanical installations and upgrades to complex renovation components such as mold, termites and foundation issues, you’ll learn how to break down your renovation into its major and minor components, learn the most common tasks associated with those renovation components, and learn how to accurately price each of the renovation tasks. If you have any questions about this product by BiggerPockets Publishing, LLC, contact us by completing and submitting the form below. If you are looking for a specif part number, please include it with your message.